At InnovAge, our employees make a difference in the lives of those they serve every day. When joining our team, you’ll find yourself part of an organization focused on redefining the journey of aging. Our innovative programs span five states and offer amazing opportunities for candidates in a variety of roles. We offer many career opportunities for candidates who love working with seniors. 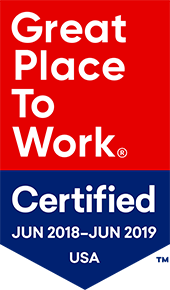 InnovAge is proud to be certified as a Great Place to Work, based on a survey of employees. The certification recognizes InnovAge values respect, fairness, credibility, camaraderie, and pride. InnovAge is proud to offer a comprehensive benefits package to eligible regular full-time and regular part-time employees who work at least 24 hours per week. We realize that benefits and a great work environment are an important part of your total compensation package and a key way in which you take care of yourself and your family. Our benefits package includes medical, dental, vision, Flexible Spending Accounts, 401K basic life and AD&D insurance, short and long-term disability, paid time off, and more! Our culture is built on care. We care deeply about those we serve as well as one another. We value our laughter, empathy and simple, well-timed hugs. To see more of our culture, visit us on Facebook.